Improve occupancy rates with the Lead Management Tool that will help you match tenant prospects to available properties. This feature goes beyond traditional tenant lead tracking systems and automatically matches a prospective tenant to your available properties based on their interests and rental preferences. Don’t have anything available at the moment that matches a prospect's interests? No problem, tenants can save their preferences and get an automatic email when a property becomes available that meets their needs. 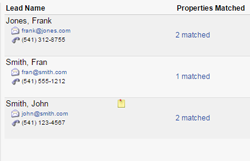 Learn how to match tenant leads to available properties.